The Central Zone bench (Bhopal) of National Green Tribunal (NGT) recently ordered all producers and manufactures of electrical and electronic equipment (EEE) in Madhya Pradesh, Chhattisgarh and Rajasthan to set up collection centres and take back systems for discarded electronic goods. The bench came down heavily on producers and manufacturers for failing to implement extended producer responsibility (EPR), under E-waste rules 2011. There is only one e-waste collection centre in the whole of Madhya Pradesh. The situation is no different for most of the states of the country. EPR is the most defining provision in the e-waste regulation of our country. According to EPR, manufacturers are responsible for the post-consumer waste of their respective EEE products. The e-waste rules were notified in 2011 and came into effect in 2012. It has been three years since the rules were notified and two years since they came into force but only a handful of companies have come forward to manage the end of life cycle of the products that have been put by them in the market. Majority of the brands operating in India do not have a tangible EPR in place for taking back or managing their end of life EEE. A recent study by non profit Toxics Link found out that despite having a take back system in place, it does not function for most brands. The producers/manufacturers do not have adequate information on their website, customer care representatives do not have inkling about any take back or recycling programme and even if they have set up collection centres, they are simply not enough for a geographically vast country like India. “India being a vast country, setting up collection mechanism is a big challenge. If any of the brands try individually to reach out to all corners of the country, it will economically not be sustainable or feasible,” says Priti Mahesh, senior programme coordinator, Toxics Link. Another major question in e-waste management in India is how to include thousands of producers and importers under the ambit of regulation. India can take a cue from Norway which has e-waste take back system in place for more than a decade now. When the e-waste rules were introduced in Norway, the country faced similar questions. The authorities were finding it extremely difficult to enforce and follow up so many entities producing and importing electronics in the country. The deliberations conceptualised the idea of EPR which culminated in e-waste regulation. The Ministry of Environment in Norway signed an agreement to set up take back companies with the producers and importers of electronic waste as early as 1998. It was a voluntary agreement and was later followed by an e-waste regulation in 1999. Like the rules in India, management of e-waste in Norway is also a producer responsibility and producers are defined as Norwegian manufacturers and importers of EEE. The process, however, is not a simple one. Before starting off, the take back companies in Norway need to get an approval from the NEA. The approval process includes a verification of nearly about 50 criterions besides third party having to certify them. The process includes providing a plan detailing how they will collect e-waste and treat it in an environmentally sound way. They also need to ensure that they will collect all e-waste from their market share which is determined by how much of electronics is put into the market by their members. The take back companies report back to Waste Electrical and Electronic Equipment (WEEE) register and also finance WEEE register. WEEE register, however is, managed by the government and maintains all records regarding e-waste in the country. In contrast, India does not have any data on the electronics being manufactured and imported in the country. There is no national registry taking account of the producers operating in the country and the amount of EEE introduced by them in the market. 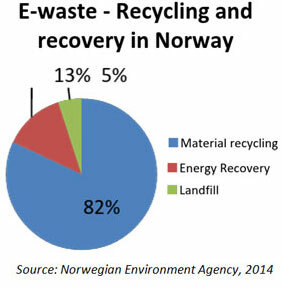 How the regulation improved management of e-waste in Norway? Since 1999, when reporting on the collection of e-waste was initiated in Norway, the collection rate has risen continuously. More than 143,790 tonnes of e-waste was collected in Norway in 2012. In 2013, the collection increased to 146,018 tonnes. “According to reports from the take back companies, the material recovery rate of collected e-waste was an astounding 82 per cent in 2012, and the energy recovery (waste to energy) rate was about 13 per cent. In Oslo, around 25 per cent of the district heating comes from waste incineration. Only about 5 per cent of e-waste was reported to be land-filled in 2012,” tells Silje. Huge amount of recycling and recovery of e-waste in Norway has only been possible due to the presence of efficient take back system and the collective interest of the producers to comply with the legislations. In a stark contrast, the formal collection mechanisms in India are able to capture only five per cent of the end of life EEE and a huge chunk lands in the informal sector putting a question mark on the recycling and recovery of e-waste. In the absence of stringent regulatory framework producers are having a free ride. It is also true that it is difficult for individual producers to fulfill all the parameters prescribed in the legislation, but they can do it at ease as a collective organisation. Priti agrees that a Producer Responsibility Organisations (PROs) which could comprise of producers/industries that work together to comply with the rules, enforce EPR and take back or an independent company taking charge of collection in the lines of Norwegian system will work in India. The process, however, needs to be tweaked according to Indian requirements. NGT has given a deadline of May 26, 2015 to three states (Madhya Pradesh, Chhattisgarh and Rajasthan) to comply with the order. It is now to be seen how the stakeholders who turned a blind eye to the rules, conform to this order. 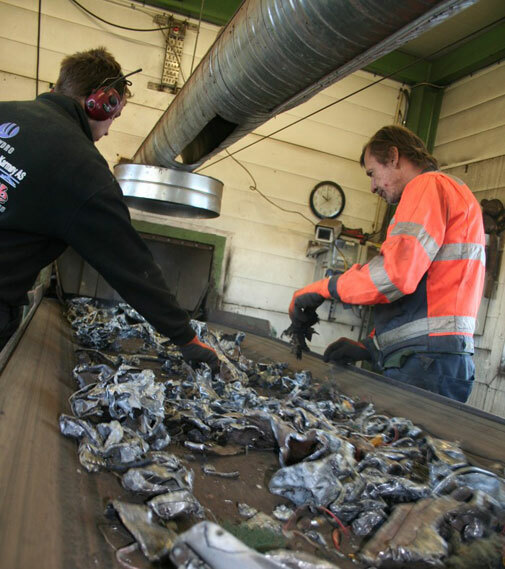 The blog is overall very impressive and provides a good overview of the best practices followed in Norway for the E-waste collection and treatment system. I really liked it and'll definitely be back to look at it again when you come up with the series of exciting BLOG. Our country is passing through an Electronic equipment boom. With the governments at the centre and states striving for paperless offices, the use of computers is on a rapid rise. Likewise every household has at least one computer and on an average two cell phones. The side effects of the toxic substances present in these equipments are coming to fore daily. In the government sector there are regulations for disposal of used/outdated/unserviceable stores. For example, the unserviceable tents used by the survey organisations of the govt. are bought by the KVIC at a pre-decided price. These are recycled. Likewise there are standard procedures laid down for all store items. However, unfortunately there are no laid standard procedures for the electronic equipment. All the govt offices have in their backyards/attics and less frequented rooms, heaps of used and unserviceable equipment. Apart from the manufacturers the govts have also to develop a procedure, like for other stores for disposal of such stores. An estimated 50 million tons of E-waste are produced each year. The USA discards 30 million computers each year and 100 million phones are disposed of in Europe each year. The Environmental Protection Agency estimates that only 15-20% of e-waste is recycled, the rest of these electronics go directly into landfills and incinerators. According to a report by UNEP titled, "Recycling - from E-Waste to Resources," the amount of e-waste being produced - including mobile phones and computers - could rise by as much as 500 percent over the next decade in some countries, such as India. The United States is the world leader in producing electronic waste, tossing away about 3 million tons each year. China already produces about 2.3 million tons (2010 estimate) domestically, second only to the United States. And, despite having banned e-waste imports, China remains a major e-waste dumping ground for developed countries. Electrical waste contains hazardous but also valuable and scarce materials. Up to 60 elements can be found in complex electronics. In the United States, an estimated 70% of heavy metals in landfills comes from discarded electronics. While there is agreement that the number of discarded electronic devices is increasing, there is considerable disagreement about the relative risk (compared to automobile scrap, for example), and strong disagreement whether curtailing trade in used electronics will improve conditions, or make them worse. According to an article in Motherboard, attempts to restrict the trade have driven reputable companies out of the supply chain, with unintended consequences. In just over a decade, India will have on its hands a whopping 130 million obsolete desktop computers and 900 million laptops to dispose of, a new research paper estimates. Besides the sheer volume of non-biodegradable material this entails, e-waste involves distinctly hazardous substances such as cadmium, mercury, lead, arsenic and a blend of plastics that are difficult to remove from the environment, says the study published in the latest edition of International Journey of Environmental Technology and Management. E-Parisaraa Pvt. Ltd, Bengaluru, India's first Government authorized electronic waste recycler started operations from September 2005, is engaged in handling, recycling and reusing of Waste Electrical and Electronic Equipment (WEEE) in eco friendly way. The initiative is to aim at reducing the accumulation of used and discarded electronic and electrical equipmentÃ”Ã‡Ã–s, which most end up in landfills or partly recycled in a unhygienic conditions by backyard recyclers and then partly thrown into waste streams damaging the environment. The objective of E-Parisaraa is to create an opportunity to transfer waste into socially and industrially beneficial raw materials like valuable metals, plastics and glass using simple, cost efficient, home grown, environmental friendly technologies suitable to Indian Conditions. Today the electronic waste recycling business is in all areas of the developed world a large and rapidly consolidating business. People tend to forget that properly disposing of or reusing electronics can help prevent health problems, create jobs, and reduce greenhouse-gas emissions. Part of this evolution has involved greater diversion of electronic waste from energy-intensive down cycling processes (e.g., conventional recycling), where equipment is reverted to a raw material form. This recycling is done by sorting, dismantling, and recovery of valuable materials. This diversion is achieved through reuse and refurbishing. The environmental and social benefits of reuse include diminished demand for new products and virgin raw materials (with their own environmental issues); larger quantities of pure water and electricity for associated manufacturing; less packaging per unit; availability of technology to wider swaths of society due to greater affordability of products; and diminished use of landfills. Audiovisual components, televisions, VCRs, stereo equipment, mobile phones, other handheld devices, and computer components contain valuable elements and substances suitable for reclamation, including lead, copper, and gold. Recycling raw materials from end-of-life electronics is the most effective solution to the growing e-waste problem. Most electronic devices contain a variety of materials, including metals that can be recovered for future uses. By dismantling and providing reuse possibilities, intact natural resources are conserved and air and water pollution caused by hazardous disposal is avoided. Additionally, recycling reduces the amount of greenhouse gas emissions caused by the manufacturing of new products. Benefits of recycling are extended when responsible recycling methods are used. In the U.S., responsible recycling aims to minimize the dangers to human health and the environment that disposed and dismantled electronics can create. Responsible recycling ensures best management practices of the electronics being recycled, worker health and safety, and consideration for the environment locally and abroad(Wikipedia). Some computer components can be reused in assembling new computer products, while others are reduced to metals that can be reused in applications as varied as construction, flatware, and jewelry. Substances found in large quantities include epoxy resins, fiberglass, PCBs, PVC(polyvinyl chlorides), thermosetting plastics, lead, tin, copper, silicon, beryllium,carbon, iron and aluminium. Elements found in small amounts include cadmium, mercury, and thallium. Elements found in trace amounts include americium, antimony, arsenic, barium,bismuth, boron, cobalt, europium, gallium, germanium, gold, indium, lithium,manganese, nickel, niobium, palladium, platinum, rhodium, ruthenium, selenium,silver, tantalum, terbium, thorium, titanium, vanadium, and yttrium. Ã”Ã‡Ã³	Americium: The radioactive source in smoke alarms. It is known to becarcinogenic. Ã”Ã‡Ã³	Mercury: Found in fluorescent tubes (numerous applications), tilt switches (mechanical doorbells, thermostats), and flat screen monitors. Health effects include sensory impairment, dermatitis, memory loss, and muscle weakness. Exposure in-utero causes fetal deficits in motor function, attention and verbal domains. Environmental effects in animals include death, reduced fertility, and slower growth and development. Ã”Ã‡Ã³	Sulphur: Found in lead-acid batteries. Health effects include liver damage, kidney damage, heart damage, eye and throat irritation. When released into the environment, it can create sulphuric acid. Ã”Ã‡Ã³	BFRs: Used as flame retardants in plastics in most electronics. Includes PBBs, PBDE, DecaBDE, OctaBDE, PentaBDE. Health effects include impaired development of the nervous system, thyroid problems, liver problems. Environmental effects: similar effects as in animals as humans. PBBs were banned from 1973 to 1977 on. PCBs were banned during the 1980s. Ã”Ã‡Ã³	Cadmium: Found in light-sensitive resistors, corrosion-resistant alloys for marine and aviation environments, and nickel-cadmium batteries. The most common form of cadmium is found in Nickel-cadmium rechargeable batteries. These batteries tend to contain between 6 and 18% cadmium. The sale of Nickel-Cadmium batteries has been banned in the European Union except for medical use. When not properly recycled it can leach into the soil, harming microorganisms and disrupting the soil ecosystem. Exposure is caused by proximity to hazardous waste sites and factories and workers in the metal refining industry. The inhalation of cadmium can cause severe damage to the lungs and is also known to cause kidney damage. Cadmium is also associated with deficits in cognition, learning, behavior, and neuromotor skills in children. Ã”Ã‡Ã³	Beryllium oxide: Filler in some thermal interface materials such as thermal grease used on heatsinks for CPUs and power transistors, magnetrons, X-ray-transparent ceramic windows, heat transfer fins in vacuum tubes, and gas lasers. Ã”Ã‡Ã³	Perfluorooctanoic acid (PFOA): Found in Non-stick cookware (PTFE), used as an antistatic additive in industrial applications, and found in electronics. PFOAs are formed synthetically through environmental degradation and, in mice, after oral uptake. Studies in mice have found the following health effects: Hepatotoxicity, developmental toxicity, immunotoxicity, hormonal effects and carcinogenic effects. Studies have found increased maternal PFOA levels to be associated with an increased risk of spontaneous abortion (miscarriage) and stillbirth. Increased maternal levels of PFOA are also associated with decreases in mean gestational age (preterm birth), mean birth weight (low birth weight), mean birth length (small for gestational age), and mean APGAR score. Hexavalent chromium: A known carcinogen after occupational inhalation exposure. There is also evidence of cytotixic and genotoxic effects of some chemicals, which have been shown to inhibit cell proliferation, cause cell membrane lesion, cause DNA single-strand breaks, and elevate Reactive Oxygen Species (ROS) levels. That's an actual briefing on the most hazardous problem after the IT boom and now, smart gadget revolution in India, China etc. The actual problem is most of the waste is handled by local dealers who do not handle scrap responsibly. Thanks for such a nice post, Sir. I too agree that we should have proper system in place for collection and taking back the e-waste by the manufacturing companies. But won't it be a bit too much to follow the European or American laws blindly? We in India still have a system wherein for example if a household upgrades from a a television to LED, the existing television set is not dumped as waste but is sold to someone who cannot afford to buy a new television. So we should surely have such system that e-waste is properly managed and systematically disposed but at the same time should refrain from blindly following Norway or any other Western country and instead should come up with some novel system of our own wherein anything is not a waste till it is totally unusable. Had this blog / article come up with such novel idea and compared it with the Western world system it would have been much more interesting instead of just narrating the best practices in the Norwegian system & its experience and then doing nothing back home. That is what we expect atleast from a organisation like CSE. Great read, thank you for posting. I especially appreciated how you referenced Norway's success (and struggles). It always helps to guide by example. I think with the mobile market booming in India, e-waste will need to be addressed sooner than later. Will you be doing a follow up as to the progress of the states you mentioned above? I believe there is a real opportunity for these states to be positive examples for other states. Great post! Thanks you so much for the share. It is indeed a helpful one. I am looking forward of reading more article with the similar topic as this one. Good luck and More Power.e waste recyclers in india. Thanks a lot for sharing, such a great topic with us ,i really appreciate this topic and we should follow Norway . 1)firstly EPR (Extended producer responsibility) should be promoted more and more so that electronic manufacturers will conduct take back programs which helps consumers to access recycling services easily. 2) secondly E-waste recyclers should have a collection centers so that consumers can easily access recycling services. 3) lastly more and more awareness need to be created to recycle ewaste and recycling companies should explain the importance of recycling how they can safeguard the nature by recycling hazardious scrap or ewaste. website like http://www.zolopik.com has government authorized ewaste recyclers where consumers can access recyclers online.